What do you do when you’ve made too much caramel popcorn? You put it on top of a cake! Cakes are soft and mushy and deserve a little crunch. Not that I ever need a reason to make cake, but on this particular instance, I was really craving chocolate. Since embarking on my apple recipe fest, I needed a serious break from the fruit. Obviously, chocolate is the solution to every problem. 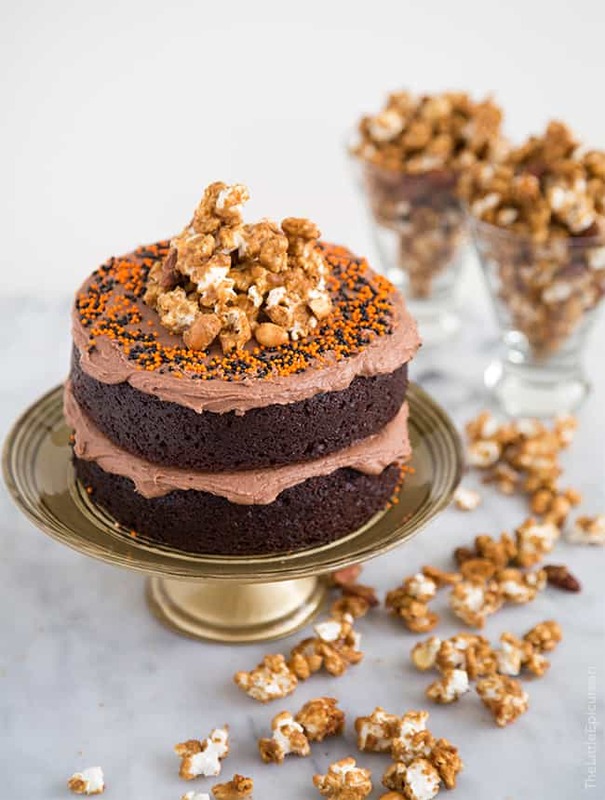 This chocolate cake is unlike any other chocolate cake I’ve made in the past. Instead of using butter, this the cake batter exclusively uses olive oil. Because of this, the cake is super moist. No need to use your best olive oil, reserve that for drizzling, salad dressings, and such. For this purpose, I suggest using a mild tasting olive oil so it does overpower the chocolate. Peanut butter and chocolate is one of my favorite combinations. See: peanut butter chocolate bundt cake, chocolate dipped peanut butter ice cream sandwiches, peanut butter chocolate swirl cookies, and peanut butter cookie dough brownies for proof. 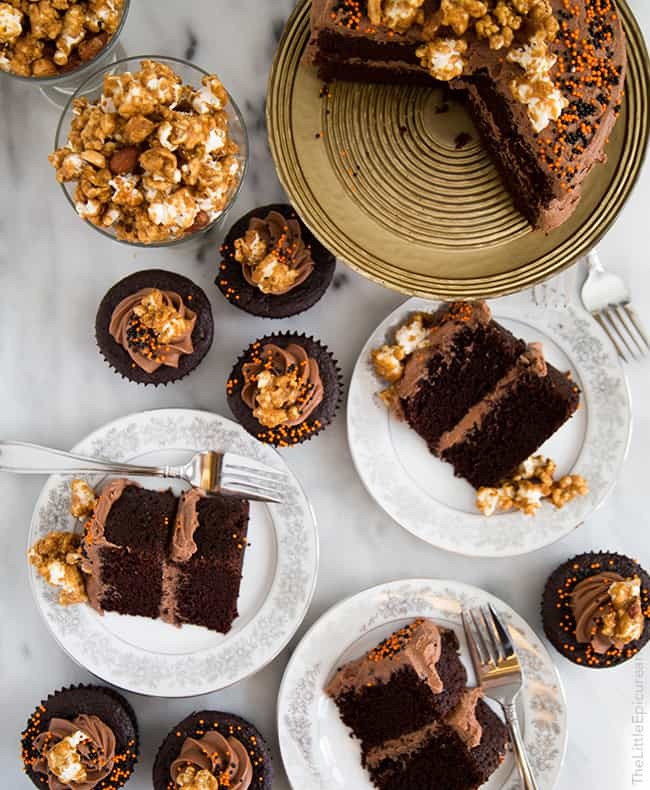 This recipe makes a two layer 6-inch cake and six cupcakes. You can also omit the cupcakes and use the recipe to make a two layer 8-inch cake. I made the cupcakes because I enjoy having perfectly portioned treats waiting for me to eat in the afternoon. No slicing required, no plates necessary, and minimal clean up after eating. Speaking of cupcakes… when they did stop being one of the cool kids? I still have tons of colorful and decorative cupcake wrappers just begging to be used. The big secret to this peanut butter chocolate cake is the rich, creamy, and delicious peanut butter chocolate frosting. 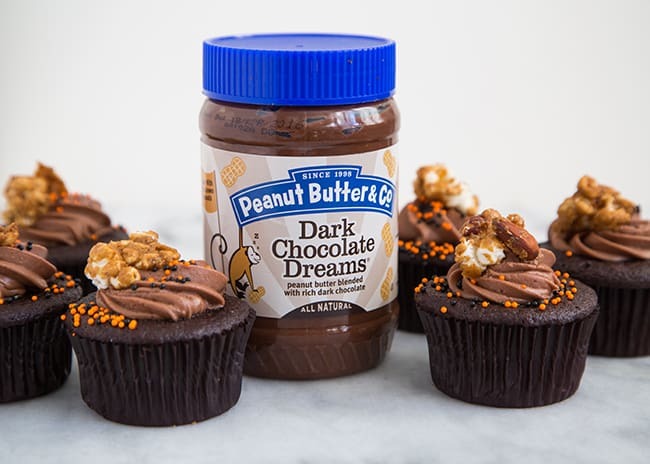 You could melt some chocolate and whip it together with smooth peanut butter… or you could use Peanut Butter & Co.’s Dark Chocolate Dreams. I choose the latter. Back in college, I was addicted to Peanut Butter & Co.’s peanut butters, especially the Cinnamon Raisin Swirl peanut butter. Oh man, I would eat that stuff by the spoonful. 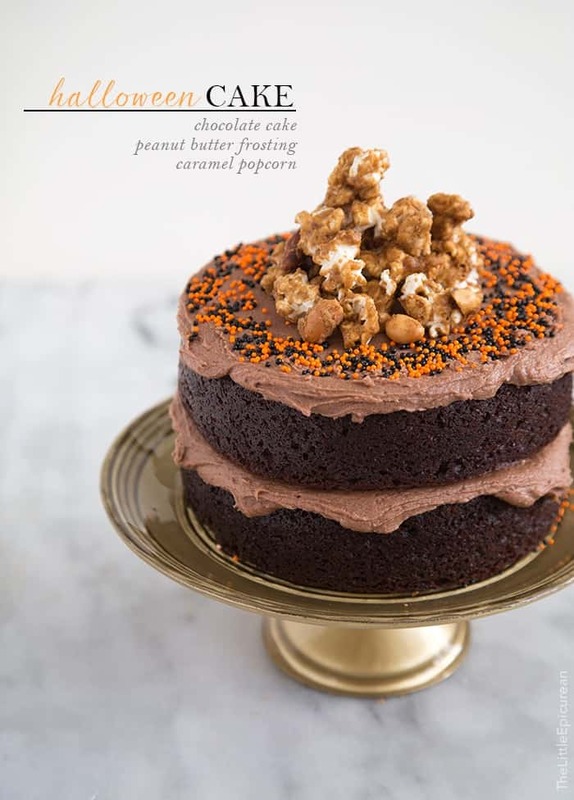 The peanut butter chocolate frosting really ties this entire cake together. 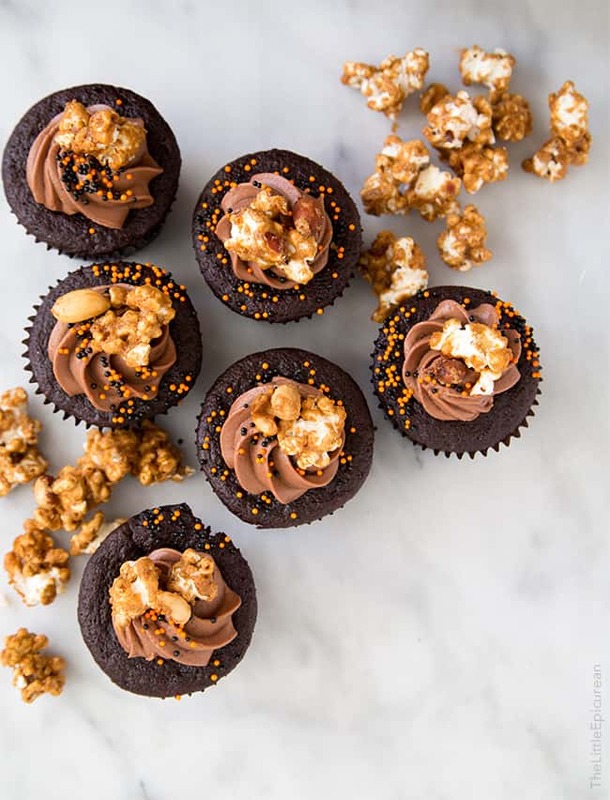 Have you had chocolate peanut butter with caramel popcorn? Um… YES, it’s pretty amazing. Preheat oven to 350 degrees F. Butter two 6-inch cake pans and line with parchment paper. Line muffin tin with 6 cupcake wrappers. Set aside. In the bowl of stand mixer fitted with a paddle attachment, combine flour, cocoa powder, baking soda, baking power, salt and sugar. In another bowl, whisk together buttermilk, olive oil, and eggs. Slow add wet mixture to dry mixture. Mix on slow speed until almost incorporated. Then slow add the cooled espresso and mix until just combined. Scrape down bowl as needed to ensure thorough mixing. Fill muffin tins 3/4 full of batter. Divide the remaining batter between the two prepared cake pans. Bake cupcakes for 25-30 minutes. Bake cakes for 30-35 minutes until toothpick inserted in center of cake comes out clean. Remove cupcakes from tin and allow to cool to room temperature of wire rack. Allow cake to cool in pan for about 15 minutes before unmolding and allowing to cool on wire rack. In the bowl of a stand mixer fitted with a paddle attachment, beat together chocolate peanut butter and butter until smooth. Add confectioners' sugar, vanilla, and heavy cream. Mix until frosting is fluffy and smooth. Scrape down bowl as necessary during mixing. If frosting is too thick, add additional cream 1 tsp at a time until desired consistency is achieved. Note: The folks at Peanut Butter & Co. provided me with samples of their products. I was not compensated for this post. All opinions are my own. This cake sounds so moist with the use of olive oil. And that peanut butter frosting, total yum! Pinning! Thanks Jen! I LOVE the frosting! Oh my goodness. This cake is so cute! Peanut butter frosting is a weakness of mine. I have got to pin this! Thanks Miranda! I share your weakness for pb frosting. It’s just so hard to say no, especially when its whipped with chocolate! This cake is seriously sensational! Had to pin right away! I want some perfectly portioned chocolate peanut butter treats waiting for me when I get home! (Except I don’t go anywhere, so I’d eat them all in one afternoon…). Also, I don’t think I’ve ever seen a cake/cupcake so perfectly decorated before. Aw, THANKS Sarah :) Haha, thank goodness Charlie needs to be let outside every once in a while so I can leave the kitchen. I love the idea of using olive oil in a cake! Actually, I also love the idea of combining chocolate, caramel, and peanut butter! The visual contrast of the popcorn is so striking! I’m a host over at #FoodieFridays…if you like a good link party, I hope you’ll come check us out!